Since it has been over 3 months since my last SDWS post, it is time for a catch up post! This is kind of a first semester recap too, though I am planning on doing a separate post specifically about my first semester of SLP grad school! Since my last post, I met my clients, assessed them, and treated them for the rest of the semester! I had an adult with fluent aphasia, an adult with non-fluent aphasia, a child with a few articulation problems, and a child with fluency problems! They were all great clients, especially for my first semester. And I got to discharge both of my pediatric clients at the end of the semester which was fun! September started with a JohnnySwim concert, and then a Ben Rector concert later in the month! It also was filled with many visits to coffee shops to work on homework while still seeing friends! October began with sad news that Marie Catribs, a restaurant in Grand Rapids that had amazing brunch and sweets, would be closing. One of my housemates and I went to grab cupcakes one last time! I also went to ArtPrize in October, which is an annual event in Downtown Grand Rapids where artists submit pieces and they are displayed all over the city. These red alligators were my favorite and I wish I could have gotten a better picture of them during the day time instead of at night! In the midst of these fun outings, I also had all my midterms in October! Never a fun time, but I did well on all of them which was encouraging! I also went home for a weekend in mid-October after midterms were over. At the end of October to Holland, Michigan for the first time! People in GR seem to go there all the time, especially in the summer. But somehow I hadn’t been before, so when a few friends invited me I tagged along! They also have a Giordanos in Holland, so we enjoyed some deep dish pizza before going to the lake and then to downtown Holland! Then at the very end of October was Corgis in the Park, which is one of my favorite days of the year! I went last year and again this year, and it is such so fun to see all the cute little corgis running around! Afterwards I went out to brunch with my friends to Anna’s House and had their red velvet pancakes which are delicious. It took until November, but I finally made it to an apple orchard! We grabbed some donuts and apples to enjoy, and a cider slushy. This month I had to do a lot of group projects and projects in general, which meant meeting up at coffee shops to work on the weekends. I tried That Early Bird for the first time and thought this chai latte with a little heart on top was cute! Anddd more donuts! Slightly disappointed that Krispy Kreme didn’t have any christmasy donuts in mid-November, but they were still delicious regardless. My house also had a little Christmas party the weekend before Thanksgiving break! 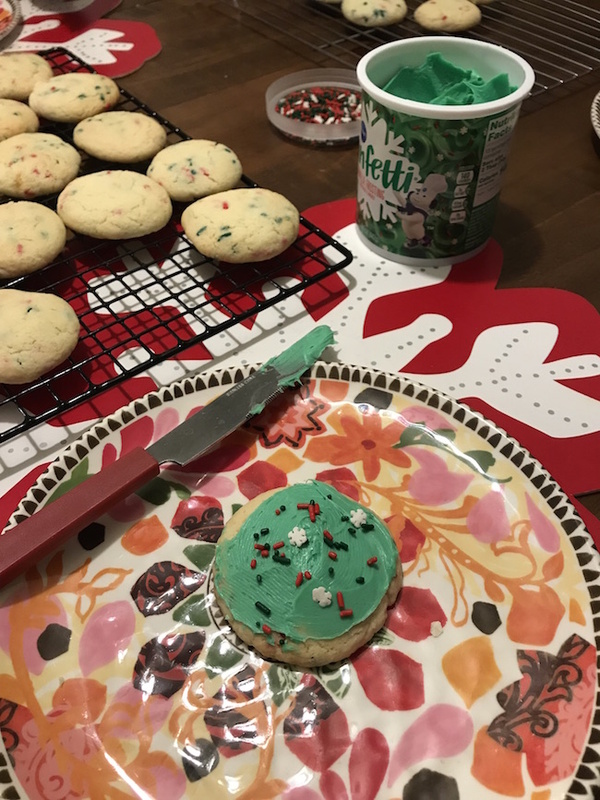 We put up our tree, decorated our house, and made Christmas cookies. And of course watched a cheesy Christmas movie. Then I got all the kitty snuggles and peppermint ice cream pie over Thanksgiving break! After break, I came back and had two more weeks of clinic, then my birthday, my 7 year blogiversary (!! ), and then finals week! Now I am home for Christmas break and I am getting so much blogging done and reading so many books because I am not used to having nothing to do after being constantly busy this past semester! I know this post was a little more picture heavy than most SDWS posts are, but honestly this semester has been so busy that pretty much the only way I can remember what I did was looking through my camera roll! What was your favorite thing you did this fall? Tell me in the comments below!